The UsuryFree Eye Opener: Join Us In The Cause For UsuryFree Living! Our world in this 21st Century will certainly be a better place to live in than that of the previous Century if (and only if) usury is abolished forever. Become a usuryfree creative and teach others what they don't know they don't know. Abolishing usury will halt the unspeakable, economic chaos and stop the accelerating slide to a global financial disaster. Unless usury is abolished and the heirarchy of evil dismanteld and replaced with visionaries who advocate usuryfree living, debtors (individuals, families, small to medium-sized businesses, giant transnational corporations, municipalities, provinces, states, countries) will be forever enslaved and another Depression will descend on this world that will make the Depression of the 1930’s look like a Sunday picnic. Become a usuryfree creative and commit to experiencing the reality of usuryfree living! AND DO IT NOW! Read the UsuryFree Eye Opener regularly and share the information with others who are ready and willing to be re-educated on topics that formal education neglects to teach. Become aware that "UsuryFree Living is the Alternative to Living With Usury." Learn about the UsuryFree Community Currency Movement and take action to launch a usuryfree time currency in your local community. There is an abundance of background information about the usuryfree community currency movement on the internet. Simply go to any search engine and type any of these word combinations: “usuryfree community currency movement,” “usuryfree network,” “usuryfree day,” “usuryfree week,” “usuryfree living,” “life without usury,” etc. 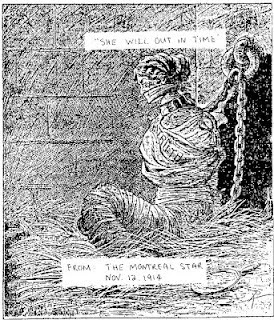 NOTE: The graphic shown at the top of the page was published in the Montreal Star on November 14, 1914 and it says: "TRUTH" - "She will out in time." I am convinced that the usuryfree time currency movement will play a leading role in "outing the TRUTH" and ushering an a new age of "usuryfree living" for everyone on planet earth. AND readers are invited to help us promote the Eighth Annual UsuryFree Week from November 13th - 19th, 2012. UsuryFree Day for 2012 will be November 13th. AND the Eighth Annual UsuryFree Week will happen from November 13th to 19th, 2012. Start making plans now to host a local event. Help usuryfree creatives celebrate this Eighth Annual UsuryFree Day and Week.